Photos courtesy of Surfacing Solutions Inc.
Well, imagine you’re the guy picked to create and install concrete countertops in two rooftop BBQ areas — about 250 square feet of concrete in each. That’s a lot of sweat so clients can enjoy a breeze. Surfacing Solutions Inc., based in Temecula, Calif., was tapped to do the job, which was completed in April. Each BBQ area consisted of more than 10 pieces, some with close to 10-foot spans, with backsplashes fitting behind lower-deck countertops in the assembled BBQ kitchens. 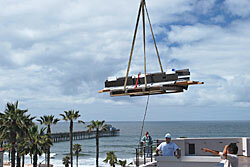 Pieces were precast in glass-fiber reinforced concrete at Surfacing Solutions’ shop. Why GFRC? 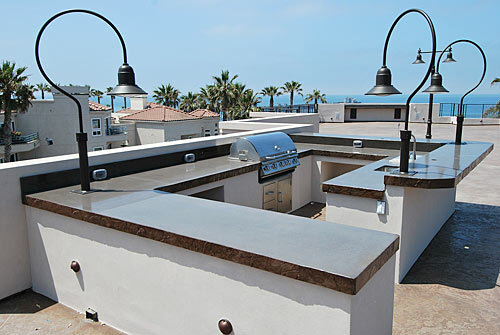 The general contractor wanted the least amount of weight on the roof as possible, while the client wanted custom pieces that incorporated the bar tops and backsplashes as seamless units. Each countertop incorporated No. 16 sand in the face mix, and a light polish exposed sand aggregate for a beachy feel. The 3 1/2-inch drop faces on each piece were formed using a Roman slate edge form from Proline Concrete Tools cut and hand-placed to create a unique design. “The coloring was done after exhausting ourselves to meet the demand from the owners and designers,” Halverson says. “It turned out to be a root beer coloring — browns basically.” Specifically, they used Nutmeg integral color from Concrete Solutions. The counters were sealed with gloss urethane from Westcoat Specialty Coating Systems. “The client was very impressed with the design, colors, textures and installation of the job,” Halverson says.